Taste test: I really don't get the point of these. They taste exactly like Nacho Cheesier Doritos. "New! Loud Flavor!" Yeah, right. They're not new, and they're certainly not loud. Some people claim that they're slightly hotter than the Nacho Cheesier flavor, but even those people admit that the difference is barely noticeable. 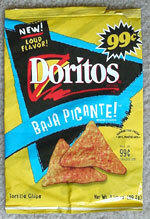 Don't get me wrong, I am a big Doritos fan, and I do like the Nacho Cheesier flavor, so these aren't bad or anything. But they're definitely not what they claim to be. From the package: “Open the bag for a LOUD taste. Baja Picante flavor tortilla chips have the BOLD taste of picante, LOADED with tomatoes, onions and spices, combined with IRRESISTIBLE cheddar cheese.” Lies, lies, lies.